Situated near the sea and the UNESCO World Heritage Site of the Valley of the Temples, the Fattoria Mosé is an ancestral country estate, home for generations to the Agnello family. Liberally splashed with the yellow, violet, scarlet and white of wild orchids, wisteria, poppies and mimosa, the Fattoria's formal and informal gardens bear prodigious succulents and palms, and the 18th-century manor, with its complex of quadrangles, quaint old relics and impromptu patios has its very own chapel which is perfect to paint. Amongst other compositions are landscapes and animals, and the 500 year-old gnarled and knotted olive trees make a fascinating study. You'll enjoy delicious meals in the manor's handsome dining room, each prepared in the Sicilian tradition and featuring the Fattoria's home-grown organic produce - such as the pistachios and olives which you might like to nibble with your evening aperitif. Later, linger for conversation in the manor's hospitable lounge. Accommodation consists of pleasing, commodious, fully-furnished apartments, each with its own private terrace overlooking a courtyard. There is also a brand-new swimming pool. 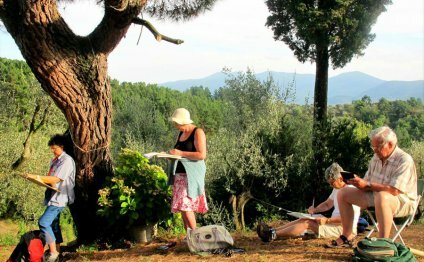 Painting trips are to the gardens and ruins of the Valley of the Temples and to the small coastal resort of Marina di Palma, where a customary seafront passegiata and a scrumptious Sicilian ice-cream-in-a-bun will make your stay complete.